This week we wanted to do something a little bit different on Princess Hairstyles and included our "camera man" in the fun. 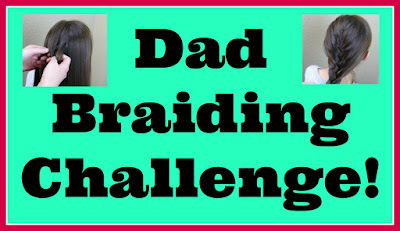 Watch our "Dad vs YouTube braiding challenge" to see just how much dad knows about braiding! P.S. Be sure to let us know how YOU did in the challenge as well! What an entertaining video! Great that Dad was willing to step up to the challenge. Thanks for sharing this. Interesting, Dad is skillful. Nice Challenge idea..